Forum for Christian IDF Soldiers files complaint against MK Hanin Zoabi, after threats against their representative in Knesset. Sha'adi Halul, the spokesman for the Forum of Christian IDF Soldiers, filed a request to the Attorney General's Office asking for the removal of immunity for MK Hanin Zoabi (Balad). 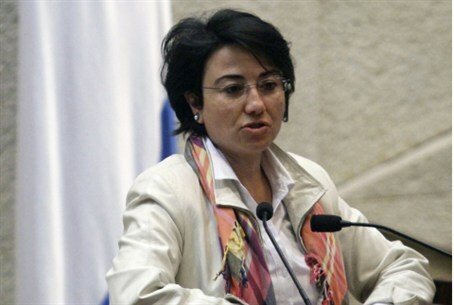 The request, which was submitted by legal representative for the forum Attorney Uri Shenhar, calls out Zoabi for turning to Halul in a Knesset Committee meeting last week and calling him a "coward" who "can't walk the streets of Nazareth and Kfar Kana and present his position" and threatened him, saying that if "you go through the streets of Nazareth and say what you want - they will give you a proper response." The request notes that the remarks could constitute a threat, and can be perceived as incitement to violence - even murder. In addition, the Forum notes that statements less offensive than these have been brought before the court for trial and have had the offenders' immunity stripped - but not Zoabi. The MK allegedly made the remarks in response to the impressive success the Forum has had in encouraging more Christians to enlist in the IDF. Those behind the efforts, particularly Greek Orthodox priest Gabriel Nadaf, have faced harassment and threats from Arab leaders, but say they remain undeterred. Several months ago, two Christian Israeli women who enlisted in the army told Channel 10 News that Zoabi does not represent them nor, in fact, does she represent many other Israeli Arabs who want to serve in the army. The request as such notes that the Forum will not decrease its activities due to the threats, and will continue to reach out to Arab communities. However, members of the Forum have expressed concern about possible threats to their safety as a result and want additional protection. By law, someone on the receiving end of threats can submit a complaint over the offender; the Forum requested that Zoabi be submitted to the full legal process, which could see her serve up to three years' prison time if convicted. "With regret, I have to say that MK Zoabi did not express herself during the Knesset session with the decorum appropriate for a Knesset member, but rather that of a member of an organized crime ring," Attorney Shenhar wrote in the request. "With that behavior, we must request that her immunity be removed and that she be tried like any other offender." The complaint comes less than two weeks after another radical Arab MK got off with a warning over threatening behavior during a Knesset committee meeting discussing freedom of worship on the Temple Mount. Jewish Home MK Zevulun Kalfa said the leniency shown towards such behavior by Arab MKs makes a mockery of the Knesset. "This is a toothless decision. How can it be that an MK is attacked during a discussion and the MK who attacked him gets a warning on his personal file as if he were a school student?" "This is not freedom of expression, but freedom of incitement, Arab MKs incite and rebel against the state, and the Knesset lets them continue to rage," argued Kalfa. "This kind of event requires a meaningful response and can't be wrapped up with a mere warning."